Central heating is a vital necessity in any property and will ensure your property is comfortable during the colder periods. COMBI-NATION will supply and install a Central Heating System designed to fit your property’s needs. Most conventional central heating systems have two water tanks situated in the loft, a large ‘cold water storage tank’ and small ‘feed and expansion tank’. Water is drawn from the cold water mains to fill up the larger ‘cold water storage tank’ and this water is then fed down to the cylinder which is typically found in the airing cupboard. The cylinder is then heated by the central heating boiler which converts the cold water into hot water which will be the source of hot water in your property. The ‘feed and expansion tank’ helps to maintain the correct level of water in the heating system. The tank also allows for expansion of the water in the radiators and pipe work when it gets hot. A real benefit of our bespoke Central Heating system is that showers, taps and running baths can be drawn in any room at the same time; not all systems can do that. If the cylinder does run out of hot water, it will have a fast recovery rate of 25 to 30 minutes (with a new boiler and cylinder). All radiators supplied by COMBI-NATION are of the highest quality and are fitted with side panels and top grilles. We provide radiators in a smooth all-white finish and use a unique two coat paint process to prolong the lifespan of your radiators. Towel rails are an essential bathroom feature and if required COMBI-NATION will supply a high-quality towel rail radiator. We have supplied a wide range of towel rails for many bathrooms including rails in chrome, white, gold and more. Our towel rails are available in a plethora of sizes to suit every bathroom. Column Radiators are ideal for property owners who want to add a different look to their room. We will provide a variety of column radiators in different finishes and colours to suit your tastes and property. Despite the initial cost being more expensive than other radiators, all column radiators supplied by COMBI-NATION are bespoke and made-to-order on the original classic cast iron design. 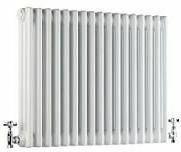 Column radiators: the Stelrad column radiator has a smooth finish to the radiator the same as a modern radiator. Classic cast iron column radiator: these MHS radiators are made of cast iron and have a textured finish which would suit the period house or the modern apartment.